My New Years resolution for 2013 was to write for Hello Giggles. The year went by and I always talked about content ideas, but never wrote anything up. Then with only 4 weeks till the end of 2013, I got to work! Creating this simple DIY Holiday Wrapping Paper Pictorial. 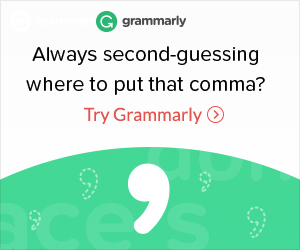 I submitted the article to Hello Giggles twice, even tweeted at the editor, yet never received a response. I think it’s safe to say that they will not be publishing my article. And thus I shall post it here! It’d be ridiculous to let a perfectly good DIY post go to waste. 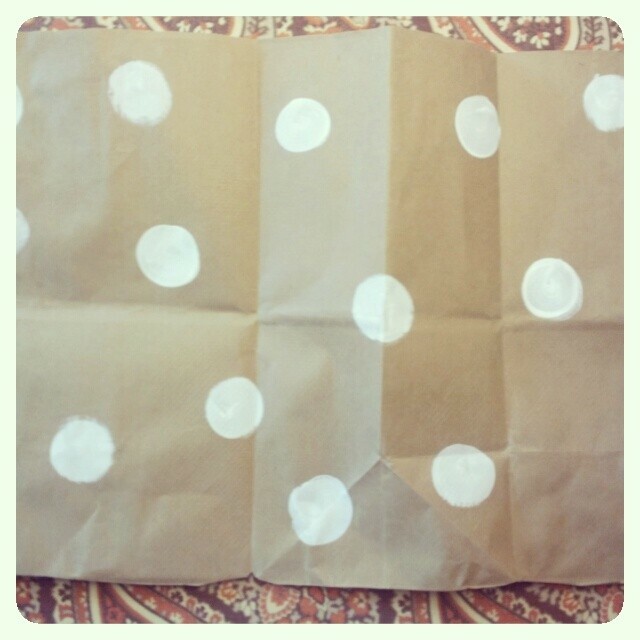 DIY Holiday Wrapping Paper – Incredibly Easy & Cheap! I understand you bring your own bags to the grocery store on a fairly consistent basis. But you needed Almond Milk, Kale Chips, and a bushel of Organic Bananas that one day when your totes were at home. 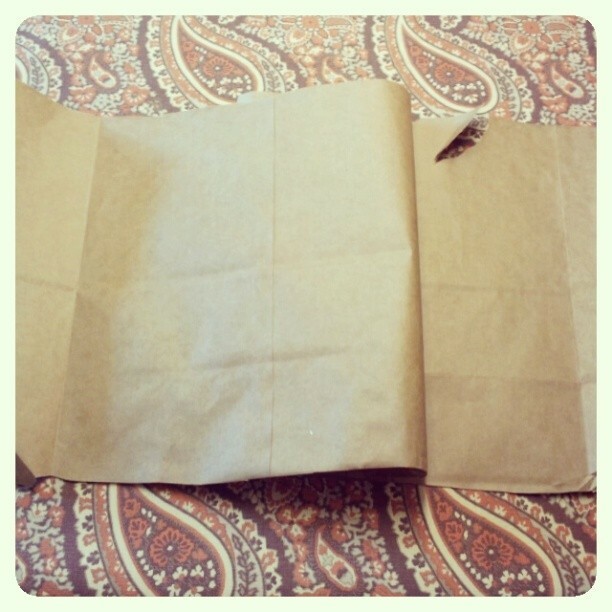 Now is the perfect time to turn those brown bags into adorable Holiday Wrapping paper! 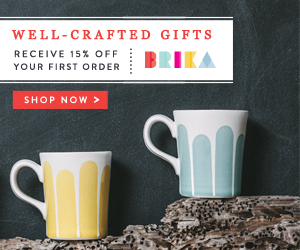 You don’t have to be artistically talented to create your own eco-friendly and stylish wrapping paper. Painting all the patterns with my non-dominate hand, I want to show how ANYONE with mild hand eye coordination could create cute “made with love” Holiday Wrapping Paper. Beauty is in the imperfections right? The key to this DIY is to NOT be overly critical of your execution. Inconsistencies become a part of the look. Step 2. 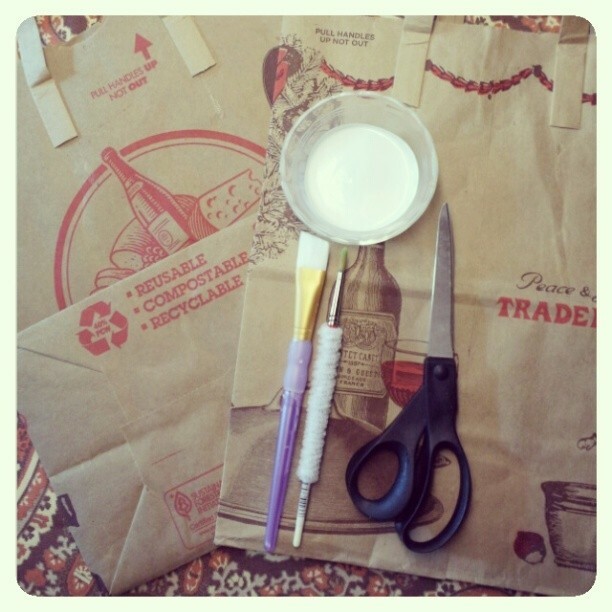 On ONE side of the bag, cut down the middle, along the folded seam or invisible line I made visible with white paint. Step 1. 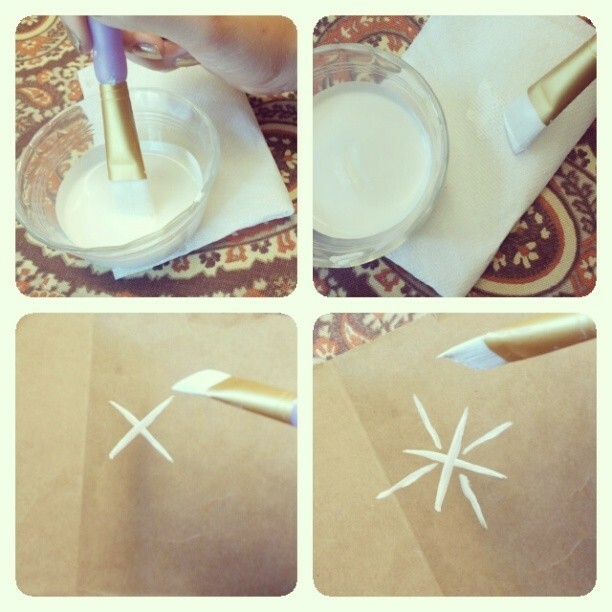 Dip only the tip of your paint brush into your paint. Step 2. 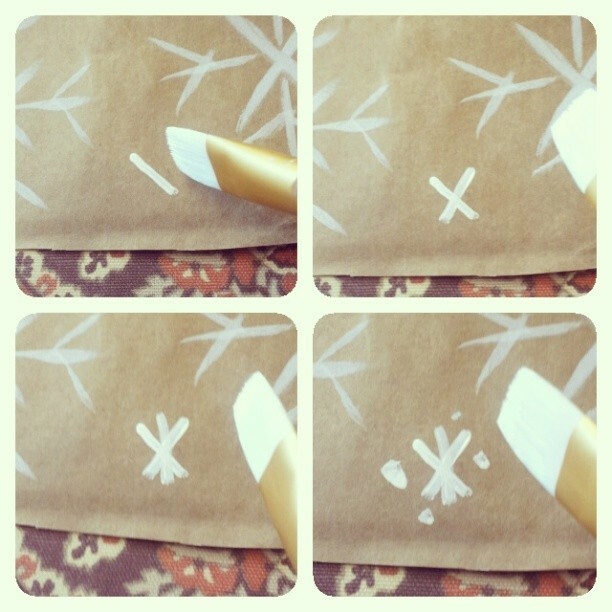 Brush some of the paint off on a paper towel before creating your pattern. Removing excess paint helps your wrapping paper dry faster. Step 4. Paint lines in the negative (empty) spots around the X. Step 5. Paint a V on each disconnected line, like an upside down arrow. Place your V a little below the end of the line. Step 6. 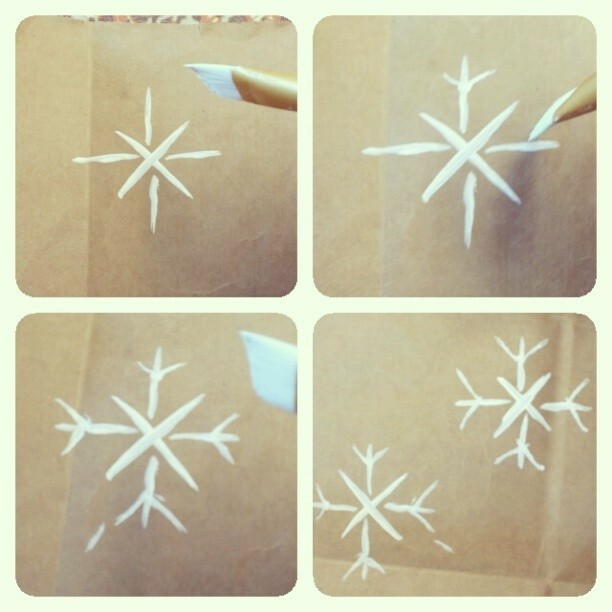 Repeat this snowflake design all over the paper. Try not to put the snowflakes side by side, and avoid trying to force any pattern. The pattern is already being created with the simple snowflakes. Step 10. 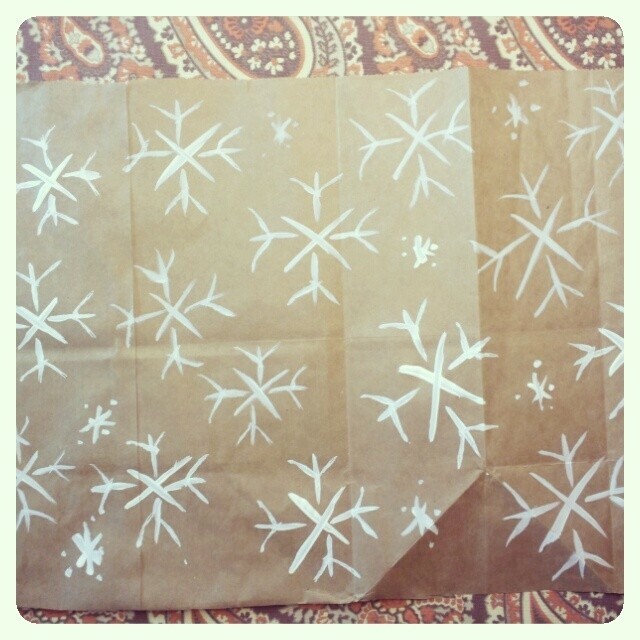 Place these snowflakes in the empty spaces around your big snowflakes. 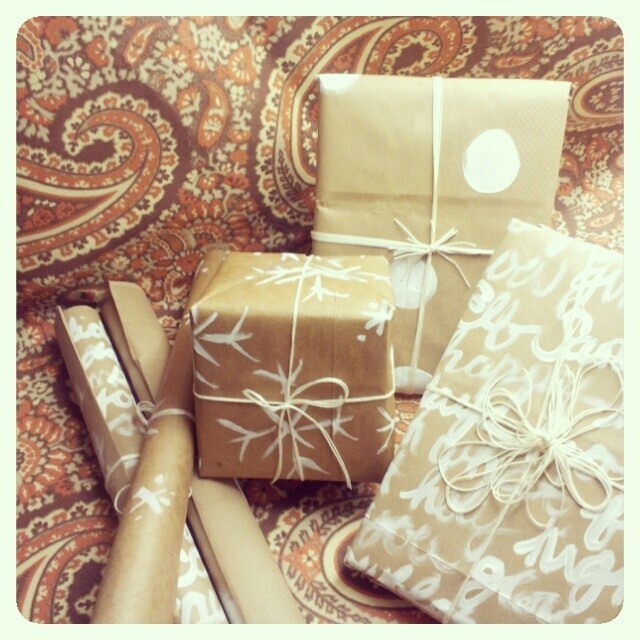 And there you have super simple and stylish holiday wrapping paper. Also a perfect solution for when you suddenly run out of wrapping paper, and don’t feel like going to the store for more. No worries! 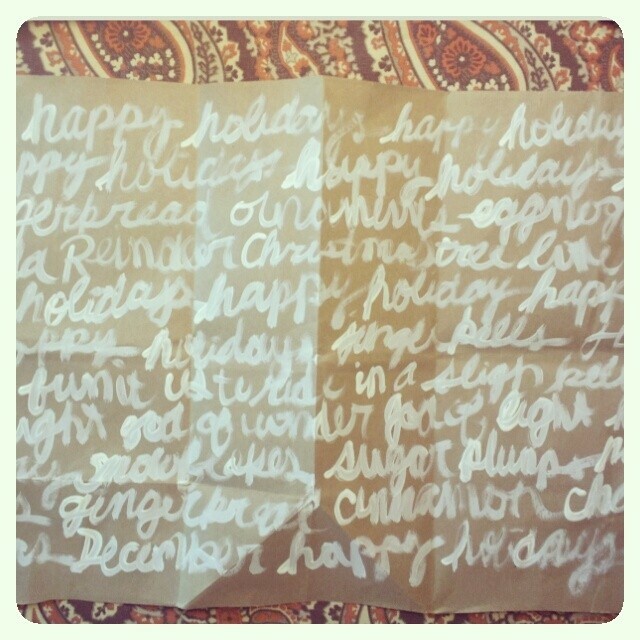 Instead hand-write your favorite Holiday Carols or things you love about the season over and over again on the paper. Don’t stress about a straight line, but painting with a round brush will make this a lot easier. The key to this design is to only refresh your paint brush after your lettering has become faint, once refreshed just continuing writing where you left off. AND YOU CAN NEVER GO WRONG WITH DOTS! DISCLAIMER: Scotch tape does have a harder time sticking to the brown paper, but just slap a few extra strips or use shipping tape instead. 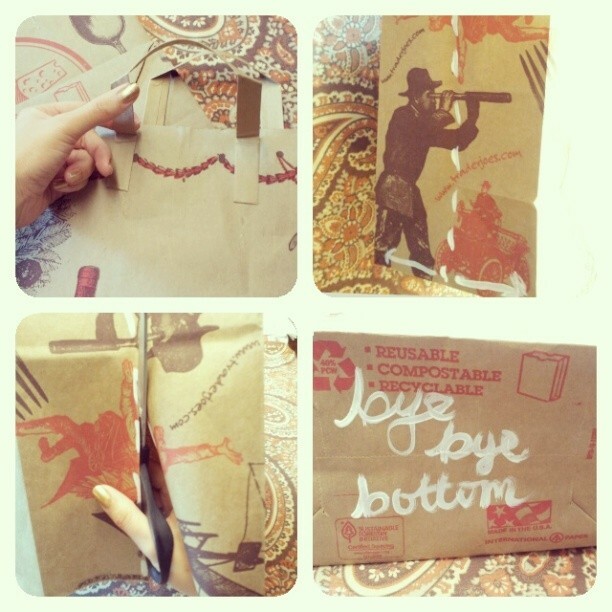 Hope you enjoy making this really easy holiday wrapping paper. This takes no time at all, except about 5-10 minutes to dry (SUPER) thoroughly. Posting the steps on Instagram took more time than it did to create the snowflake holiday wrap! 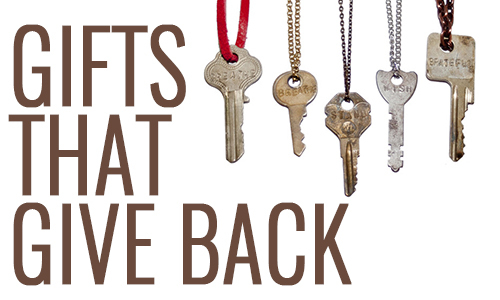 Share your DIY holiday wrapping paper with us. So that was the article…what did you think? Although I didn’t get on Hello Giggles, I’m content with my attempt. I allowed life to distract me from my resolution, and I didn’t commit myself to it. But I figure as long as it isn’t the NEW YEAR YET, I think its better to try and sprint to the finish line then continue to just wander aimlessly right in front of it. It’s (very rarely) never too late to start and work on your goals. I love your DIY! And don’t get discouraged about the tutorial not making it on Hello Giggles! Who reads it anyways?